If it's not there, revert to partsouq vin search. Another scenario is finding parts for a car/model/grade where you don't have access to the vin. Buying parts: get quotes via part number (or VIN) from your dealership, Makin & Luby, Garage88, Benny's Custom Works, Revzone, Gotitrex, Tuspeed, Street to Track, Kobe Motorsport, http://www.becauseracecar.com.au etc or via your mechanic. Online/international: try Celtic Motorsports, Rallysport Direct, Jegs, Nengun, JapanParts, Amayama, eBay, Partsouq etc. Secondhand or used parts, try your local self server wreckers or Subaru specialist wreckers. Last edited by bigBADbenny on Wed Apr 24, 2019 9:42 pm, edited 12 times in total. 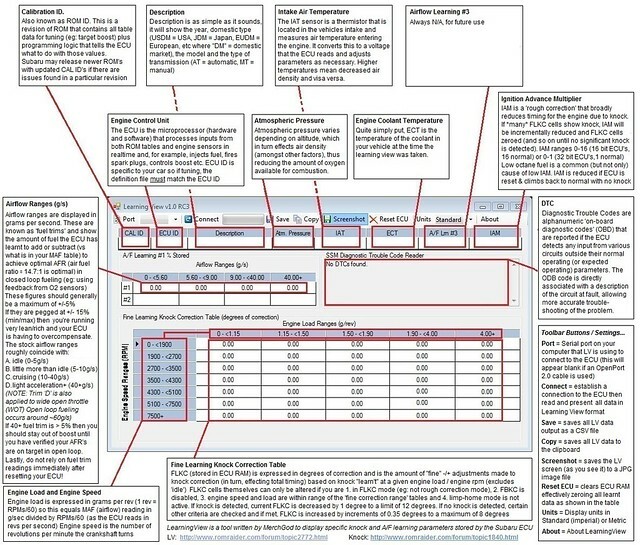 And the fsm & parts into are the key to giving your reqest context. Last edited by bigBADbenny on Wed Sep 06, 2017 10:24 pm, edited 1 time in total. This guide was written, primarily from memory, based on everything I had ever read in my research on open source tuning of Subarus. The keyword is open source, a community generated project for the benefit of all. If you can contribute anything to this guide please add your comments and of course CMIIW on any points, that is, correct me if I'm wrong. I'll strive to refine and add to the info here regardless. Needless to say, attempting any of the procedures in this guide will be entirely at your own risk. Please don't even consider modifying the engine of your Subaru without getting a tune first, and then getting that tune adjusted for subsequent modifications. This applies especially to the exhaust, intake, turbo and fueling systems. Your Subaru is highly intolerant of mods without suitable tuning! If you mod without a tune, your (especially turbo) car will run terribly and probably blow a piston ring land, rod or bearing, requiring an engine rebuild or replacement costing thousands of dollars. The stock tune is optimized primarily for knock control and emissions mitigation, so even a stock car can benefit from a tune, especially as regards enhancing reliability, economy and performance. Some tuners are also expert in improving the response of the automatic gearbox, which even further reinforces the case for tuning a stock car. Using a laptop pc and a Tactrix OBDII is the best method for keep tabs on your engine's health and paves the way for getting your car tuned. For day to day use I recommend the BtSsm app used with the BtSsm BT plug, Tactrix or VagCom plugs. Bare minimum and better than nothing: elm327 and Torque app etc. Power is a dangerous thing in inexperienced hands. The classic quote is: " the performance felt absolutely fantastic... and then it blew up ". So you have your stock, tuned-for-emissions, car, with its tiny turbo and intercooler, all optimised for low end response, perhaps you upgrade the exhaust and maybe the inlet and it sounds more powerful, hopefully you got a tune too, but wow it's going great and you want more, it's just numbers, right? More boost more power! More power! It feels amazing, more boost!!! Right? WOOT! I'm an unashamed POWER addict!!! YEAH!! No. It's just going to feel great then blow up. It will be a failed head gasket, broken ringland, cracked cylinder liner, lifted head spun bearing, bent rod or blown turbo, but it will be gone. Why? Firstly: due to a lack of any enhanced support and disregarding the limits of the stock components. A car is basically a support system for a series of controlled explosions, air fire, fuel and spark must all work in harmony to provide motive power. If balance is not maintained, failure will ensue. Secondly: Because the ej255 (and to a degree the other garden variety turbo EJ's etc.) was developed for extra torque at stock power levels only. Aspects of its design for that purpose mean inherent compromises to factors that relate to high power builds. Rod ratio, oiling and cylinder strength being the primary candidates. A fairly weak serial delivery fuel line system being the other. Uel headers on the postFL being another. Put them all together, it's intolerant to running on the edge. Thirdly: stock tune optimised for emissions first. You want a drive-ability/reliability tune. What the heck am I even talking about? dr20t wrote: My strong advice to anyone chasing over 200kw atw from an EJ series motor is to ensure its tuned on a dyno, with knock ears. This is even more important on stock pistons running 98 Ron fuel. E85 I would be more concerned about cylinder pressure and dynamic compression ratio which can only be tested on a dyno as you can push well past MBT on e85 without knowing it until you get reversion or diminishing piston speed / torque. And that can only be properly done on a dyno. In my opinion you can't blame a tuner for an under engineered engine from the get go. Whoever thinks the ej255 is a good platform for anything over 200kw atw is off their tree. The ej255 is an economy engine not a race engine. Again it does come down to quality of parts and build quality but in this instance the fact is the ej255 is not conducive to sustainable high power. I know I've said in the past that they can be built to 230awkw reliably. But the more I learn the more I refine that backward. The ej255 is simply not built to tolerate high cylinder pressures for a long time in stock form. Moral of the story - you pay to play. Bolt on mod choice is critical, as is engine history etc. Tune needs to be spot on and don't risk any bolt on mods without a tune. To sum up, if you want reliability over time, the EJ255 is not the engine to chase a dyno figure to brag about. Its an engine that can shine, on the street, with supporting mods and a conservative tune. Whilst this guide is not specific to the ej255 I thought the point was worth hammering home, and most of the issues covered do affect the 2 liters and certain generations of ej257s in varying degrees. Heads up! So get a tune, support and build upon the stock system with the right mods and enjoy a more reliable, efficient and fun Subaru. PS: Even more so if you have an auto and choose the right tuner. Bad Noodle guide to tuning. Click the link to go to the DIY Subaru Parts, Procedures, Diagnostics & FSM Info page. Consider whether you want a best-case scenario, or worst case scenario as regards the state of your car or something in between. Scheduled service. Meaning fully roadworthy in all aspects. Oilchange: considered sub 5K oil change intervals? Cant hurt really. Hoses check: most of the important ones are visible in the engine bay with the cover still on: no excuses. The cover comes off very easily, so get it off and take a peek. For vacuum leaks e.g. inlet piping, google the "aerosol spray in the engine bay whilst idling" test. For positive pressure leaks a spray bottle of diluted dishwasher liquid is great for checking the BOV area, and the exhaust prior to it getting up to temp. Failing that do a smoke tester check: info on the Google. Good fuel from your trusted, regularly used outlet. When to make an LV? An LV made immediately after a reset has no Learned Values and is not very useful, unless you want to confirm your ECU was actually reset. After 30 minutes of gentle driving after an ECU reset and any time thereafter. After 30 minutes or so is a good time to begin logging and maybe make a pull, as the ECU should have learned in that time. Is that air filter clean, sealed... triple sealed? Better still send your tuner a link to your Member Profile, then they can see how you present and describe yourself and your car and your aims and wishes for it. Work out what mods require a tune immediately, and what mods don't. Induction piping: yes - may run leaner as airflow is smoother. Zorst: minor changes e.g just muffs or mid - maybe not immediately/major changes eg dump pipe - probably. 3port boost solenoid (EBCS) - yes. Research the popular mods for your vehicle, make a plan based on reality and stick to known equipment, installers, formulas that work. Trailblazing is expensive and can be frustrating! Most of all have a plan! Check Engine Light: CEL what do I do? Symptoms: power and or boost limited, cruise light and engine light on dash are flashing. The mechanical fault has put the car into limp home mode due to an error being logged by the ECU via its sensors. Depending on what model Subaru you have the CEL can be read on the dash info display, or it can be read with a mechanics OBDII scanner, a Tactrix or a BT or Wifi OBDII plug and appropriate app, keep a record of the code, Google it and depending on the severity of the issue, reset the ECU or take appropriate mechanical action to fix the ECU as releveant to the issue. ECU resetting how to basic mode: remove the battery negative terminal. Pump the brake pedal until the brake lights are extinguished, so eg if the handbrake is on: no brake light on the dash or tail lights. ECU resetting how to advanced mode:: use an OBDII adapter and app, eg Torque App or Tactrix with Learning View or RomRaider. This is preferable because one can check for any stored diagnostic codes. ECU resetting when to: whenever you have made a mod that will affect the learnt parameters in your tune. Examples: changed panel filter type, changed to heavier oil, changed OCV soilenoids, cleaned filthy MAF. Some cars require an ECU reset after flashing a tune, you can check this by taking a learning view after reflashing. No learnt parameters equals a reset ECU. ECU resetting when NOT to: When you have a CEL and no method to read the code. Usually if you have a severe-issue CEL, the car will stay in its limp home mode. Some less severe CELs will reset themselves after a period of time. If you have a CEL, check it ASAP with an OBDII adapter of some description or find a member or mechanic who can. After an ECU reset: drive the car gently, off boost, with a mix of traffic and freeway if possible. the the concensus seems to be that 20-30 minutes is enough time for the relearning to become established. Third party feedback from a trusted contact. Now I have several trusted contacts who overlook goings on and help fill my knowledge gaps. 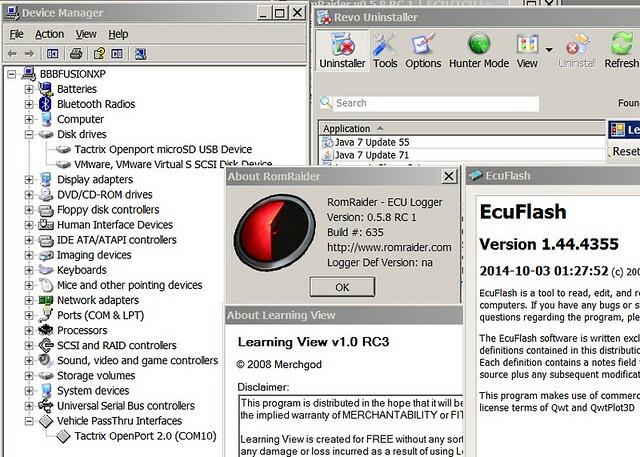 BtSsm allows monitoring, logging etc, but no ECUflash. Torque app via Android BT or iPhone Wifi OBDII adapter. Monitor at least: boost in psi, AF1 afr, Ign tot timing, learned Ign timing. Tactrix w/RomRaider, LearningView on PC. No monitoring = no tune. A clean third gear pull please! WOT 2500rpm to the rev limiter, or 6500rpm (2.5T). An airflow run: 15 minutes of mixed normal non-high boost driving city/freeway mix. No high boost OK? The more concise your logs are, the less irrelevant crapola your tuner has to wade through. The Pull: This is really important! Get on Google maps and find the very longest freeway ramp in your area and the next longest nearest that and so on. When? When the traffic is quiet of course, if things don't look or feel right, back off and move to the next ramp or go round again, or pick another time. Turn off the freeway and enter the next ramp or cross the bridge, wait at the lights at the return entrance ramp and if there's no oncoming traffic entering, go for it. Chances are you can do your pull to C130Kph and slow the car to the limit before merging with the traffic, if any. It's important to have a clear road, in front and behind too, as an event like a WDC CEL can be a reasonably startling thing. Better yet, do this on a freeway with a 110Kph limit. Find that freeway on-ramp, use the defogger switch or F1 on your PC keyboard or better yet get a friend to assist you. If the laptop is on a seat, use the seat belt to keep it in place for safety, better yet, use the floor. Take it easy, keep your eyes on the road! It's not a drag race, just a log, of your car, in third gear, accelerating, WOT. Remember that. Don't worry if you forget to stop the log, it will be obvious where and when you changed up or lifted. If you're super good just edit the unneeded cells in XL, OpenOffice or Pages. Use status, request & feedback forms for email. Eg. Status: where you are at, how is the tune feeling or performing. Request: what is the requirement of the revision. Recap: list of relevant mods to date. Plans: pending mods that may require a revision. Be concise, relevant, on point and brief! Do not be all "should I, could I, I wanna, I'm gunna, I plan to, I wish???"... or the classic "my cousin's chicken shop burned down...!". Carefully manage your communication with your tuner! Keep them informed of what you've done (mods and maintenance wise), what you want, what you are planning and what results you are experiencing as regards your tune, for better service. Lastly be patient, it's in the tuners interest to provide a safe tune, they are on your side! You are messing with the brain of your car, hopefully for the better. You are making changes to a cybernetic interface, please give your car and yourself time to adjust to the changes being made. Dyno plus road tuning: this is the most expensive and perhaps the best approach. Preferably you'll choose a local tuner, but members have traveled interstate to get this done, with varying degrees of success. Pros: Your tuner is also a mechanic, will check/fix/upgrade your cars mechanical state, do the tune in the controlled environment of the dyno, with further optimizations on the road, or vice versa. It doesn't need tweaking because everything is sorted, you're done modding for now and will concentrate on your aero etc. Cons: You just spent tons on a second rate tune because the tuner is not that good despite what they told you. You traveled miles for upgrades and tune only to discover a surprise issue that hinders your tune. Cons: Less real world based results, so most tuners will offer the option of tweaking the tune on the road. Road/E-tuning: can be affordable, once again best if local to tuner, usually less time available to check car for mechanical issues. Some tuners will provide revisions via logging/email. Pros: You get to meet your tuner, they experience your car in person. You discuss your aims and make requests to suit your taste. In this instance you might want to book some more of their time to firstly log the car with a view to sussing out any preexisting issues (see above) or take care of that comprehensively before getting tuned. You'll want to log both city and cruise driving. After the tune is applied, take a little time to actually experience some normal driving to see if those DBW setting really suit you, and in all modes. Get an LV & logs at the end of the session, at least to show your tuning mentor. Cons: Since you don't need to have any experience or knowledge to do this, you are totally at the mercy of your tuner, at least until you get someone to overlook their work. There is the chance (as with any tune) that they give you their tune, not the one you requested, and you accept their word that its what you wanted and asked for, because they know what they're doing, right? The tune turned out to be full of features you didn't want or need, that's if you knew about them in the first place. Pros: Can be very affordable. International pool of tuning talent. You need to know what you are doing to engage. Cons: Best for experienced owners with mechanically sorted cars. See cons above. You'll need a full understanding of the required open source software, so you may need an experienced friend locally to help you out. The key here is to not switch off the ignition at any time during the re-flash, or you will be getting your ECU unbricked, most likely by Chiptorque. Switch off your lights, HU, HVAC and any accessories to conserve power. If your battery goes flat during the procedure, leave everything in place, connect jumper leads or charger to your battery and proceed. Again: do not switch off the ignition at any time during the re-flash. I'm not sure how, but I managed to successfully test write a bad ROM, which failed to actually write, panic took hold of me and I guess I keyed off. Chiptorque reflash on Thursdays and Fridays, I sent the parcel containing the order form ECU and return envelope on Wednesday AM and received the unbricked ECU on Friday at 1PM. A maintenance battery charger, have it attached to your battery during flashing. Jaycar have a decent Cytec clone, or just get the real deal. Since the car doesnt need to be running during flashing, this is the best way to keep your ECU and laptop powered up. Its probably a good idea to disconnect once done though. A dedicated ECU flashing laptop. I'm preparing an eeePC for the job that runs from the 12V socket. Since its just for flashing and logging, its a stripped back, optimized install with basic security and little connectivity. Make sure the software and driver package is correct and without conflict. Keep Java updated, the installed versions can be managed efficiently with Revouninstaller Free. 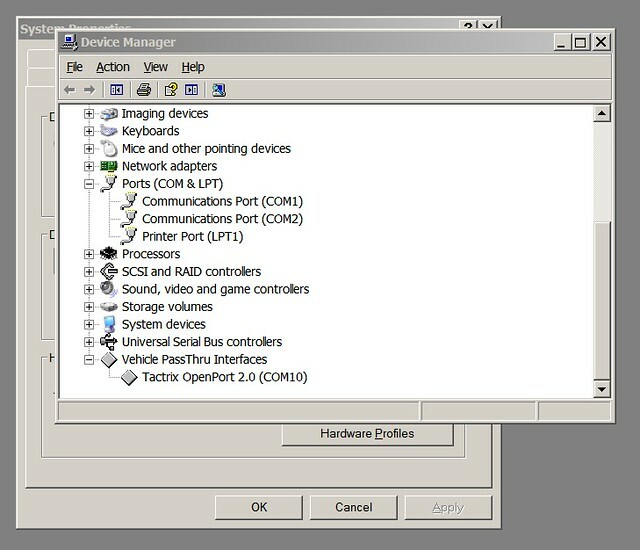 Device manager view, note the Tactrix has an mSD card in the slot. Please share the benefit of your experience for us all! Thanks especially to my esteemed fellow forum members for your continued assistance!